This is the best version of the HELIOS lens from all others versions of the Helios lenses. MC (Multi Coated) HELIOS 77m-4 1.8/50mm Russian Soviet USSR Lens M42 - Based on Zeiss Biotar. (Russian LOGO"ГЕЛИОС- 77m-4" - HELIOS- 77m-4). Excellent Chiyoko Minolta Super ROKKOR C 5cm 50mm f/2.8 Leica Screw Mount LTM L39 from Japan #1895. mount : Leica Screw Mount. 100% official genuine product. We are happy to provide answers promptly and professionally. This lens provides bright F1.1 aperture at fixed focal lengths 50mm, equivalent to 135 full width of 100mm focal length. It also provides outstanding fast and accurate shutter speed by achieving great amount of light. Used, prefectly working, Carl Zeiss Jena Prakticar Pancolar 1.4/50mm. Originally it has PB bayonet, now adapted to EOS. It is perfect for foto or video application, or for collecion piece. This serie is the latest Carl Zeiss Jena DDR lens, with the latrest glass and coating technology. Sony A6000L，NEX-6，NEX-6L，NEX-6R，NEX-7，A3000，A5000，A5100，A6000，NEX-C3，NEX-3N，NEX-3R，NEX-F3 K，NEX-3，NEX-3L，NEX-5，NEX-5N，NEX-5A，NEX-5T，NEX-5L，NEX-5C，NEX-5K，NEX-5R，VG10，VG20，VG30，EA50etc. Aperture Range f1.1 -f16. Lens Mount: M39. This is lens high quality copy based on FED lens. The lens is fully operational. No dust, fungus or any defects. Focal length - 50 mm. If there is a problem, we will help you to solve it. Samyang 50mm F1.4 AS UMC is a manual focus lens with a low F number. Especially, H-ASP minimizes color aberration to realize exceptional image quality and high contrast for center and corner of image even when aperture is fully opened. I'm glad to propose up for the sale fascinating and rear German Carl Zeiss Jena MC Prakticar (Pancolar) 1.4/50mm lens with Praktica PB mount in good working Condition. 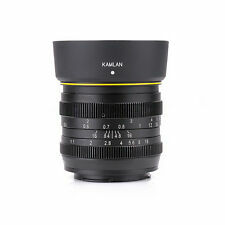 This lens is a successor of a very rare and expensive Carl Zeiss Jena Pancolar 1.4/55mm. Carl Zeiss Pancolar MC 50mm f/1.8 lens M42 mount. M42 screw mount. With multi-coated MC optics. Mint & clear lens optics with no scratches, haze or fungus. With front and rear lens cap. 50mm focal length, minium focal distance is 0.45m, which is good for various kinds of shooting, portraits, scenery, still life, etc. Focus Length: 50mm / 1.97in. Let you feel the unique charm of the manual lens and focus your mind on the image itself. (S IGMA EX 50mm 1:1.4 DG HSM For SONY. [12 Photos.] ). T he functions works fine. [Includings]. For Sony A7, A7 II, A7 III, A7R, A7RII, A7RIII, A7S, A7SII, ILCE-7, ILCE-7S, ILCE-7R, ILCE-9. - Background Blur Effect: 0.45m / 1.5ft minimum focus distance, properly handle the subjects / backgrounds in close-up portraits. I'm glad to propose up for the sale amazing lens from Carl Zeiss -Carl Zeiss Planar T 1.7/50mm AEJ with C/Y mount in Perfect working condition. Carl Zeiss Planar T 50mm f/1.7 C/Y differs from its "brother" Carl Zeiss Planar T 50 mm f/ 1.4 with longer minimal focusing distance. Lens,Front & Rear Cap. Near Mint . Focusing ring is just a little bit loose,but it is no problem to use. tiny scuffs from normal use. It shows signs of use. ■ Functional. I send a product by EMS. Glass is clean! Focal length 50 mm. Serial number: 284181. You'll get everything you see in the picture !! 50mm focal length, minium focal distance is 0.45m, which is good for various kinds of shooting, portraits, scenery, still life, etc. Focus Length: 50mm / 1.97in. Advanced optical design. The lens adopts premium optical glass with multiple coatings, can greatly block unnecessary light to reduce halo and dispersion. HELIOS-44-2 2/58mm Vologda lens with T/S. Sony Alpha NEX (E-mount). When photographing architectural objects, the distance from the lens to upper and lower parts of the object is different. Similar problems arise when photographing a model on a catwalk, interiors, sculptures placed on high stands, paintings and architectural details located at an unreachable height. Our item number: C1228. AUTO YASHINON-DX 1:1.4 f=50mm YASHICA JAPAN. Fast, sharp, 3D pop, and color that SCREAMS, "Here I am!". This is, by many accounts, the best Yashinon 50/1.4 ever made. The bokeh ranges from bubble bokeh at f/1.4 to beautiful painterly bokeh at 2 and 2.8, sharp as a tack from 5.6 on. MS HELIOS 77M! 1.8/50mm mount M42, RARE! EXPERIMENTAL VERSION! System: M42. The lens very much twists the background, has excellent sharpness, well holds the back and side light. Focal length: 50mm. Due to your different monitor setting and lighting, it may has a little color difference from the real item. 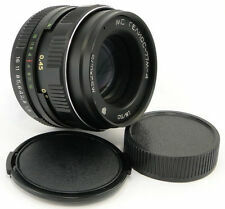 Carl Zeiss Jena Tessar Black 50mm f/2.8 lens | M42 mount. M42 screw mount✔. Clear lens optics with no scratches, haze or fungus✔. Fully tested and ready to use✔. 14 diaphragm blades create a circular aperture for more attractive out-of-focus highlights.As a manual focus and manual aperture lens, it provides a rubberized focus ring and clear aperture, distance and depth of field markings. A.Schacht Ulm Travenar R 50mm f/2.8 Manual Lens. Up for sale is A.Schacht Ulm Travenar R 50mm f/2.8 M42 manual lens. A.Schacht Ulm Travenar R 50mm f/2.8 sample 1. A.Schacht Ulm Travenar R 50mm f/2.8 sample 2. Lens is in fantastic condition with m42 mount. There are minimal signs of use because of age (like : scratches small dints no paint etc.). ✧ - Defekt. I always take a lot of pictures. cleaning marks -minimal. Aperture: F1.4-22. 50mm focal length, minium focal distance is 0.45m, which is good for various kinds of shooting, portraits, scenery, still life, etc. Focus Length: 50mm / 1.97in. Advanced optical design. MK 50mm Lens for Sony x 1. Lens Cap(front and rear) x 2. Lens Hood x 1. Lens Pouch x 1. Lens Cleaning Cloth x 1. Professional Phone Supplier. It is suitable for both product, portrait and landscape photography. The Pancolar 2/50 is rare in M42 mount and different from the Pancolar 1.8/50. PANCOLAR 2/50. - CARL ZEISS JENA DDR -PANCOLAR 50mm F/2. CARL ZEISS JENA DDR. The aperture works, the blades are dry. The focusing is smooth, the coated glass is free from fungus. Our item number: C1199. AUTO YASHINON-DX 1:1.4 f=50mm YASHICA JAPAN. Manual Focus. Identification Markings: AUTO YASHINON-DX 1:1.4 f=50mm YASHICA JAPAN. Focal Length: 50mm. Focus Motion: Manual focus range tested 10/10. ZENITAR-M 1.7/50 Russian Soviet USSR Lens M42 - Based on Zeiss Biotar. Lens mount: M42. Made in USSR. Focal length: 50mm. ⭐MINT⭐ - The Lens is in Fantastic Condition, Virtually New! Scale of diaphragms: from 1.7 to 16. Sony Alpha NEX (E-mount). When photographing architectural objects, the distance from the lens to upper and lower parts of the object is different. Similar problems arise when photographing a model on a catwalk, interiors, sculptures placed on high stands, paintings and architectural details located at an unreachable height. The aperture and the helicoid work. there is a dent where the filter should be attached. MC INDUSTAR-61 L/Z 2.8/50 Russian Soviet USSR MACRO Lens M42 - Based on Zeiss Tessar. Original Passport, original front lens cap and standard M42 rear lens cap, original box. Lens mount: M42. This lens marked by State Quality Mark of the USSR! Lens Mount - M39. Supplied: Tube, front and back cover,adapter M 39 M 42, blend. There is no long-range scale. No scale of field depth. There is a diaphragm scale. Light transmission - 0,80. Focus and diaphragm rings work properly! Our item number C1054. KONICA HEXANON AR 50mm F 1.4. ALL THE SHARPNESS YOU COULD ASK FOR! One of the sharpest lenses you can get from this period. Konica Hexanon AR lenses are highly sought after but can be hard to get your hands on because they were not in production that long. Many other clones Leica. The lens is in excellent working condition. Made in the USSR in 1973. Glass lens clean, no fungus, no scratches, no oil. Several tiny counting easy cleaning scratches on the front and back lens.Diaphragm moves nicely.